For many a bride, weddings are a whirlwind of planning, browsing, decision-making, and oftentimes stressing out -- all for the big day during which (hopefully!) all the pieces come together in a beautiful celebration with family and friends. I can think of a small handful of weddings that my assistant has attended in the past couple of years, from the serene union of two of the sweetest people she has ever met to an upbeat ceremony in which the blushing bride sang her wedding vows. Each was unique, but one thing remained the same: the bride was always beautiful -- no dark circles or droopy eyelids to reveal the lack of sleep leading up to the special day. Her secret? 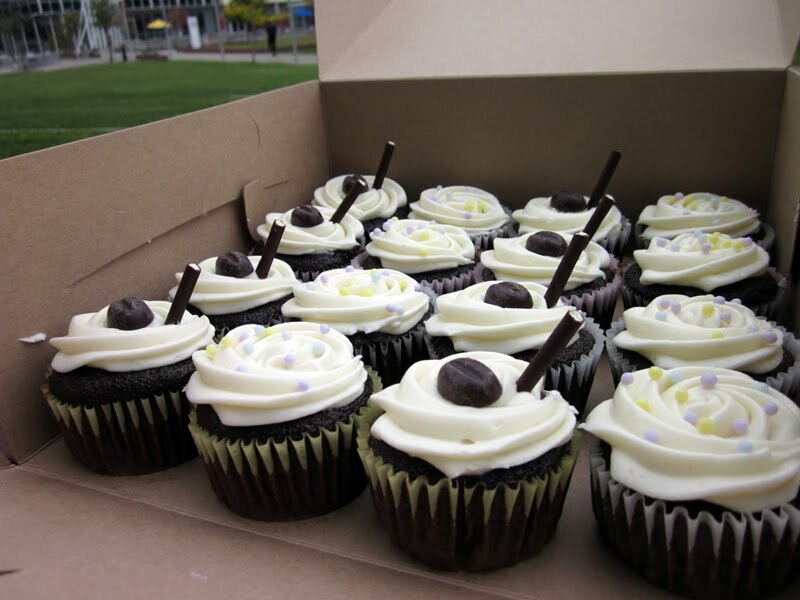 Mudslide cupcakes. While I haven't verified this little guess, I stand by this! Steve seemed to agree when he requested a box to bring to the office and share with bride-to-be Cheri right before her big day. 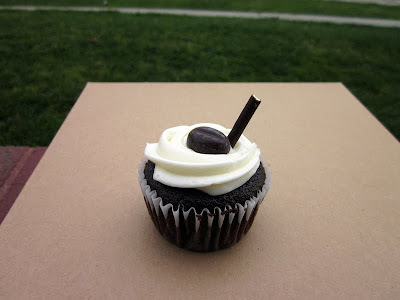 Rich, Kahlua-spiked chocolate cupcakes with Bailey's cream cheese frosting -- sweet enough to keep the bride smiling, slightly caffeinated to chase away sleepiness, and perfectly sized to ensure that she'll have no trouble fitting into her dress. Thanks so much, Steve, for trusting me with such an important order, and congratulations, Cheri!